Galu Kinondo Beach Back to Nairobi: Train, plane or bus? 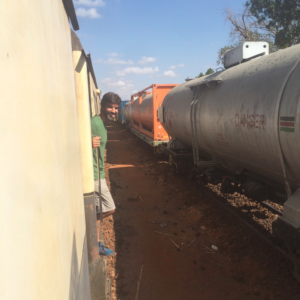 We wrote about our experience getting from Nairobi to Mombasa in this post. In our post ‘Life on a Kenyan Beach‘, we were still trying to decide how we were going to get from Galu Kinondo Beach back to Nairobi. We had train tickets, but were advised against taking the train, due to its unreliability. Indeed, the train we were supposed to take from Nairobi to Mombasa had been canceled. We were leery about taking the bus back, given our experience on the way down. I looked into flights from Diani beach, but I can’t remember exactly why we didn’t go that route. There may not have been four seats left for the date/time we needed. In the end, we decided to take our chances with the train. 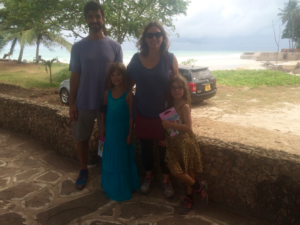 The first challenge was getting from our beach house in Galu Beach to the Mombasa train station. 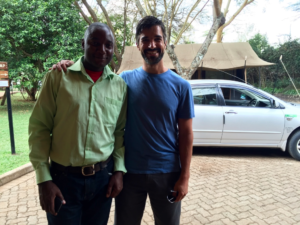 The property manager had arranged a driver for us – the same one who had picked us up in Mombasa on the way down. It was smooth sailing until we got into Mombasa County. 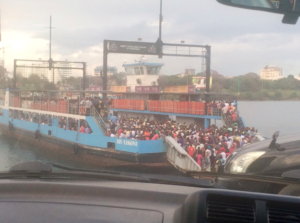 We had to take a ferry across Kilindini Port, which we had done on the way down. We did have a bit of wait to get on the ferry on the way down, but I wouldn’t say it was excessively long. People only on this ferry. It was packed! On the way back, however; it turned out that only two of the four ferries were in service. One of the two ferries was just for pedestrians…no cars! There was a long line of cars ahead of us and the line was barely moving. We were getting worried about missing our train, which was supposed to depart at 17:00. Our driver, however, turned out to be an off-duty cop. He made an arrangement with the cops on duty to get us to the front of the line. We got on the ferry, crossed the port, and made our way to the train station. I was shocked when our driver pulled into the Mombasa train station. It looked deserted, was so small, and the parking lot wasn’t even paved. Our driver waited for us to confirm that the train was leaving that day, which indeed it was. We passed through the gate to the trains, and as we were walking passed a parked train, Anthony commented that this wasn’t our train (it was very old looking). It was! 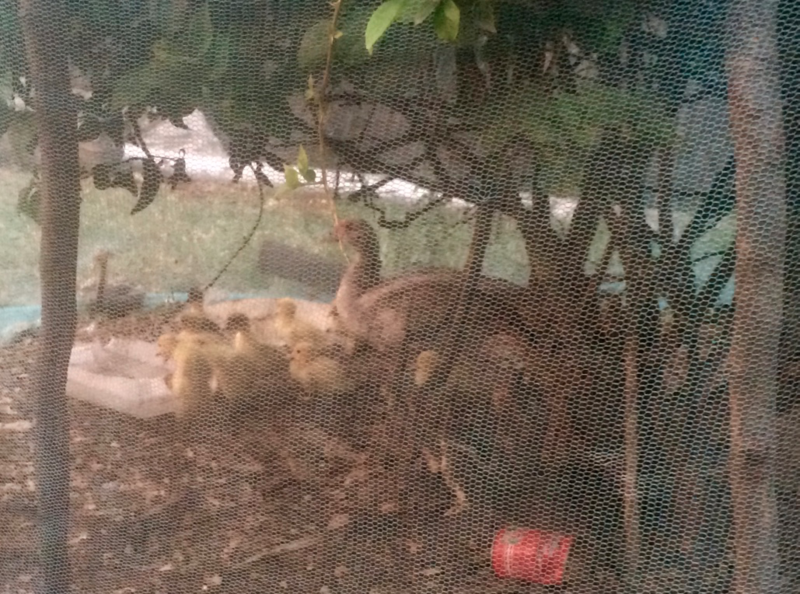 There were a couple of stores selling food and water, but the best part for my girls were the chicks onsite. 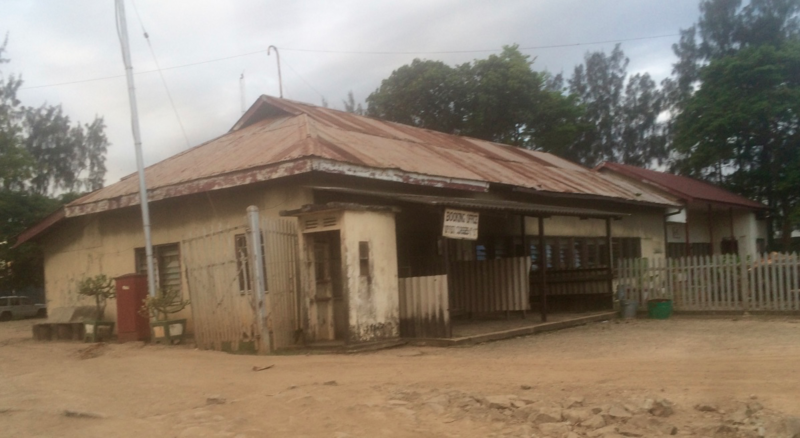 Yes, this is the Mombasa train station. Not a train in sight! The girls loved seeing the chicks! My eldest and I needed to use the bathroom after our long ride to the train station. We were told where to go, but a man diverted us to another one, which was basically a hole in the ground (a squat toilet). He wanted to charge me for using the bathroom, but I didn’t have change and said I needed to go to the ticketing counter to get change. At the ticketing counter, I was told not to pay, so I didn’t and got back on the train safely. It was hot in the dining car. Hannah liked the sugar cubes! As suspected, the train did not depart on time, however; we did ended up leaving that night (20:30 instead of 17:00). The dining cart was a throwback to the train’s more regal days. The table had a table cloth with all the dishes set out. We had a set menu, and the servers were formally dressed. Unfortunately, the A/C was not working, and the fans weren’t on. 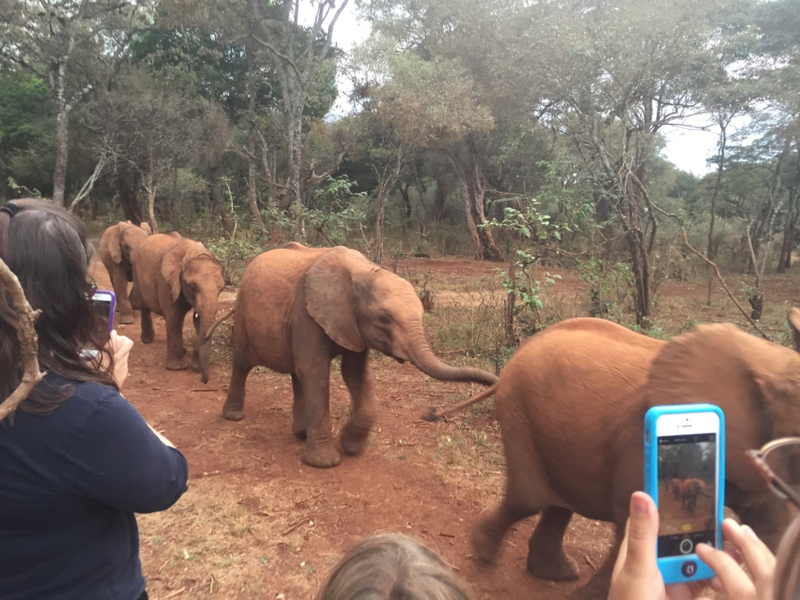 It was an overnight train and our goal was to get back to the David Sheldrick Wildlife Trust in Nairobi by 17:00 the next day to see the elephants return from the Nairobi National Forest and observe their nighttime routine. This is a benefit sponsors of orphaned elephant receive. 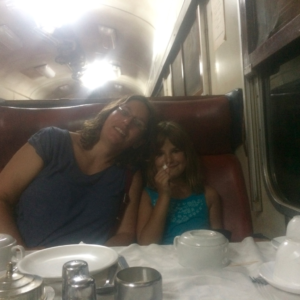 The train was originally supposed to arrive in Nairobi at 11:00AM, however, given our late departure, we anticipated arriving around 14:30, still enough time to see the elephants. It turned out that we didn’t get very far during the night, in part because the train only went about 30 miles per hour, and in part because it had to pull to the side several times to let cargo trains pass. Things weren’t looking very good, so we asked the staff on board what other options we had. One staff member also needed to get back to Nairobi faster and said we could follow her through a Kenyan village to the highway where we could catch a matatu (basically a 12-seater minibus). We decided to take our chances with the matatu, so got our luggage, left the train at the next station and followed the staff member through the village to the highway. Although Anthony was somewhat uncomfortable with the situation, the girls were preoccupied looking at the dresses hanging from the shops. View of the A109 from the Matatu. There are other cars in our lane, trying to pass traffic on the opposite side. We got on a matatu fairly quickly, though I guess it was a little too quick, as our luggage hadn’t been secured to the top properly and ended up flying off. The driver secured it better the second time and we were on our way. The thing to know about matatus is the driver does his best to have a full bus. So if someone gets off at a town before Nairobi, he’ll wait there until he can get a new passenger. This didn’t bode well for us getting to the David Sheldrick Wildlife Trust by 17:00. 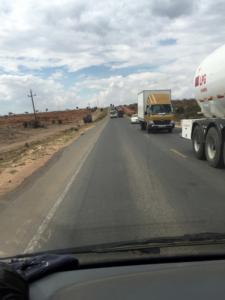 Also, the A109 to Nairobi is a two-lane highway and the chances of getting stuck in traffic are high. We decided to phone our driver we had had in Nairobi to see if he could help us out. He ended up meeting us outside the city and we took his car the rest of the way in. Although we were now getting into rush hour, we somehow miraculously made it to the David Sheldrick Wildlife Trust at 17:00 on the dot! We couldn’t believe it! Anthony with our Nairobi driver George, here to take us to the airport – He was great. If you’re going to be in Nairobi and need a good driver, let us know and we’ll send you his #! It was spectacular watching the baby elephants come in, have their milk, get their blanket on and be put to bed! Definitely worth the crazy trip back to Nairobi. Our driver waited for us and then took us to the Wildebeest Eco Camp, where we were spending our last night in Kenya. 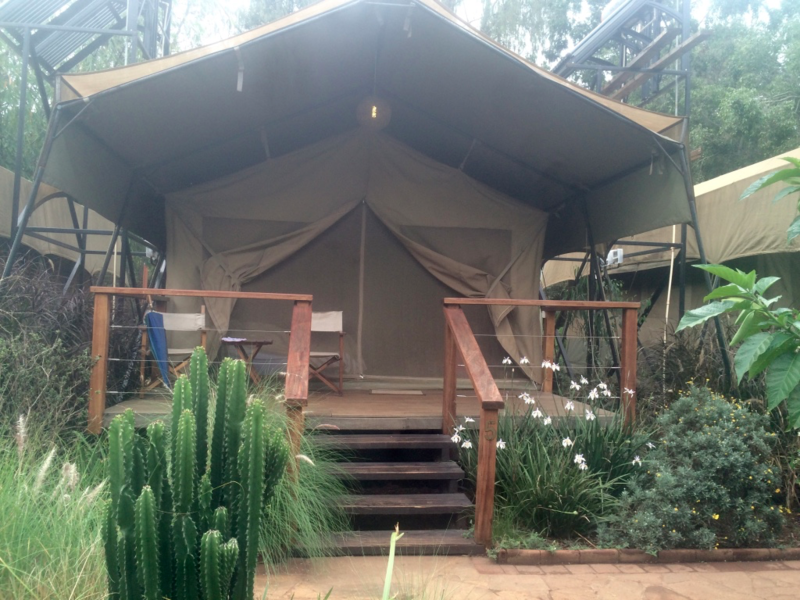 It started pouring when we arrived…the only time it rained while we were in Kenya! 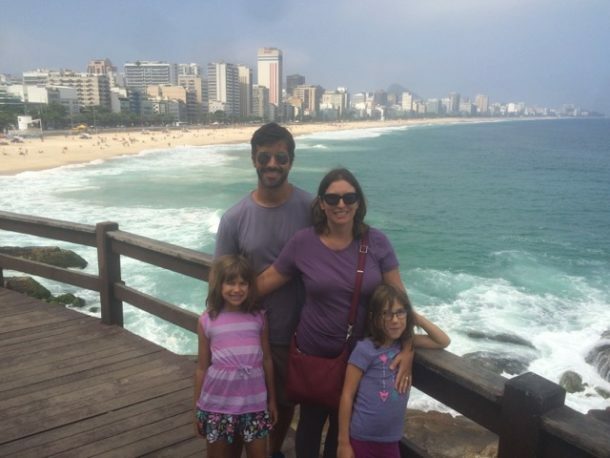 That night we had a family-style dinner where we met other travelers from around the world. The next day was sunny again, and we were able to get some laundry done and explore the Eco Camp before catching our flight to Australia. 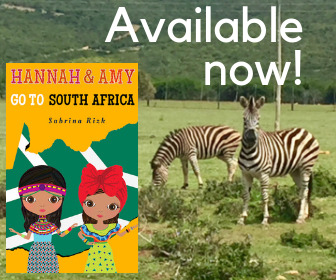 What a great way to end our time in Kenya! Watching the elephants come in for the night. The moral of the story is, if you need to get from Galu Kinondo Beach back to Nairobi, take an airplane!